CUVÉE Ray Wine Bar & Restaurant Live Music Line-Up For APRIL 2019! 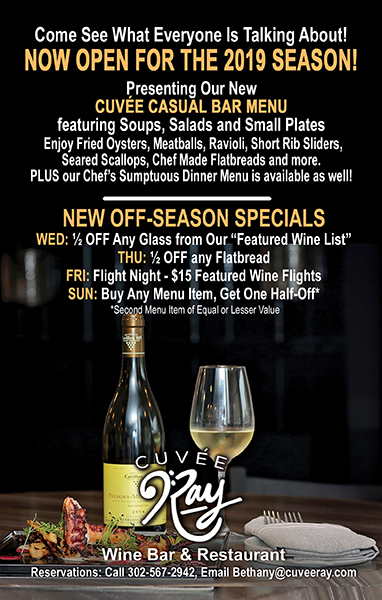 Cuvée Ray is the place to find amazing wine, incredible food and fantastic live music! Here’s the Cuvée Ray Live Music Lineup for APRIL 2019! 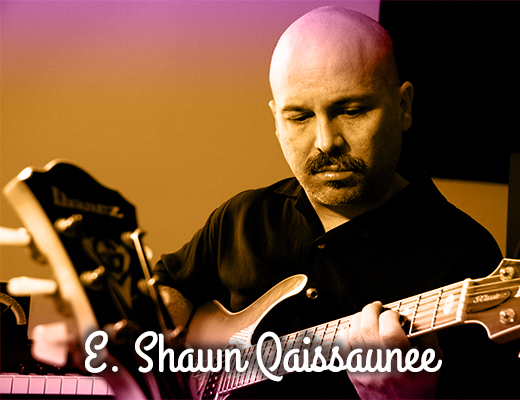 FRIDAY APRIL 5: E SHAWN QAISSAUNEE - Shawn is known for his musical sensitivity, lyricism and spirited drive to create excitement among listeners! From 6:30 to 9:30 PM! 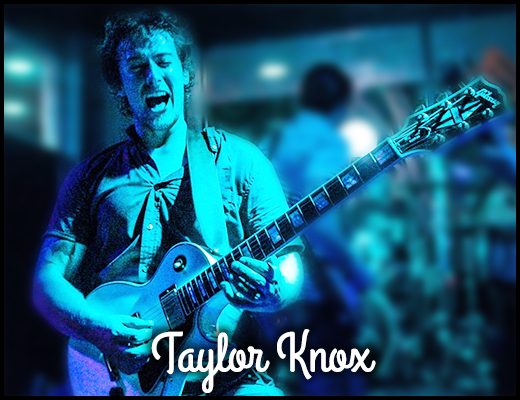 SATURDAY APRIL 6: TAYLOR KNOX - Incredible Guitar Rock and Roll! From 6:30 - 9:30 pm! 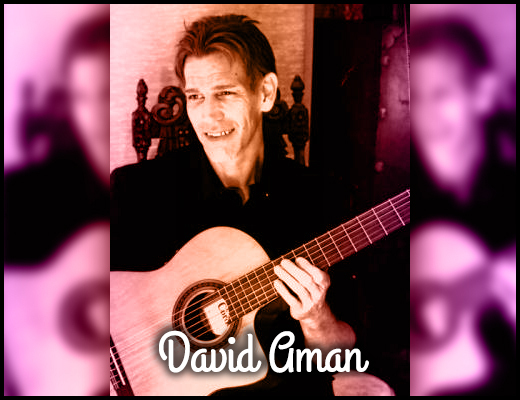 THURSDAY APRIL 11: DAVID AMAN - Crowd Loving Classic Guitar from a DelMarva based favorite! From 5:00 - 7:oo pm! 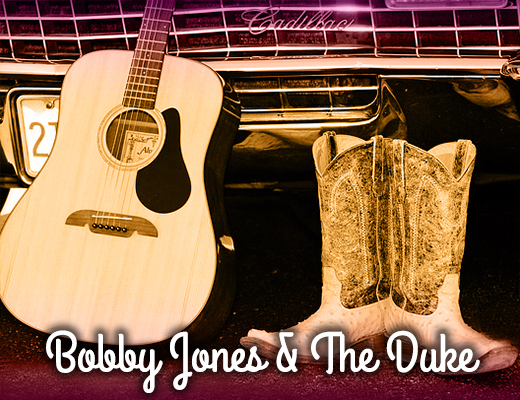 FRIDAY APRIL 12: BOBBY JONES & THE DUKE - Enjoy Pure Country! From 6:30 to 9:30 PM! 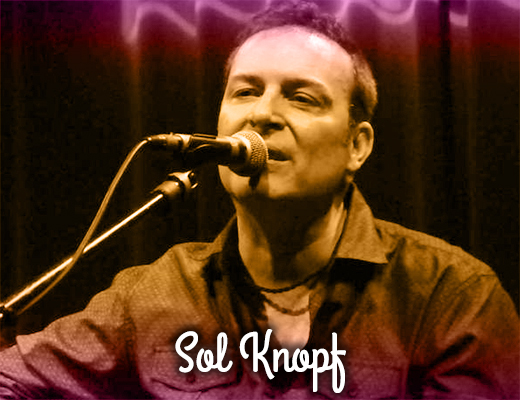 SATURDAY APRIL 13: SOL KNOPF - Enjoy the soothing vocals and guitar from award-wining singer/songwriter Sol Knopf - From 6:30 to 9:30 PM! 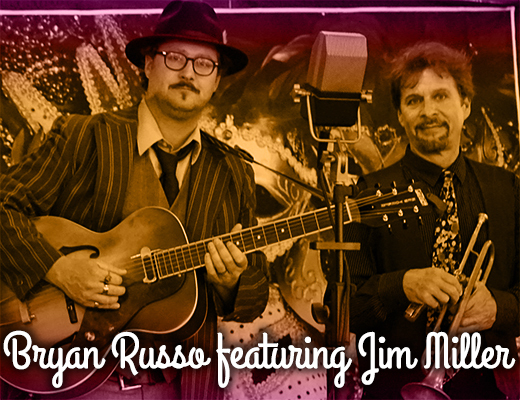 FRIDAY APRIL 19: BRYAN RUSSO FEATURING JIM MILLER - A move your feet to the beat mix of Original Blues, Jazz, Boogie and Swing - From 6:30 to 9:30 PM! 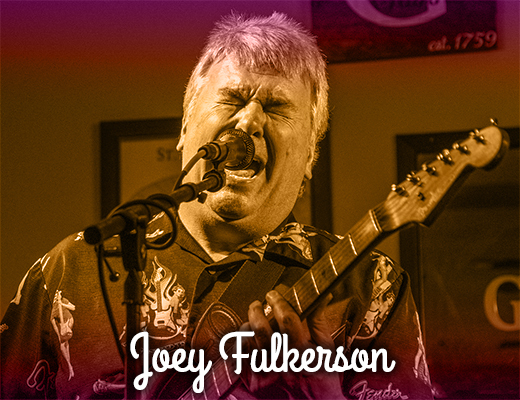 SATURDAY APRIL 20: JOEY FULKERSON - Nothin’ but the blues when Joey is in the house! - From 6:30 to 9:30 PM! 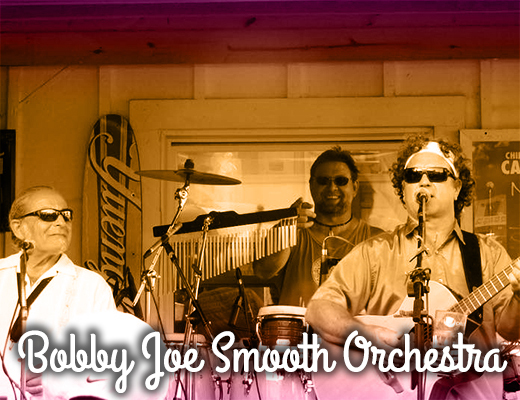 FRIDAY APRIL 26: BOBBY JOE SMOOTH ORCHESTRA - Move to the sound of Guitar, Sax & Vocals! - From 6:30 to 9:30 PM! 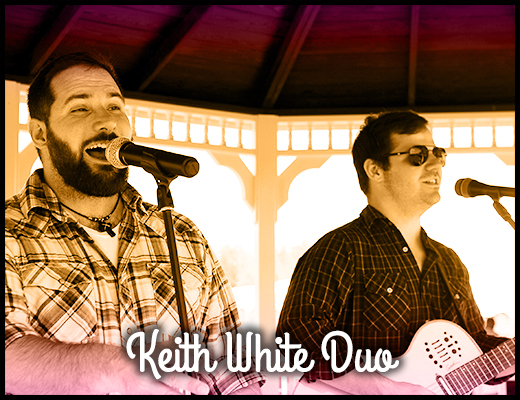 SATURDAY APRIL 27: Keith White Duo - Acoustic, Classics & Harmonies based in a steady Rock and Roll vibe from 6:30 to 9:30 PM! 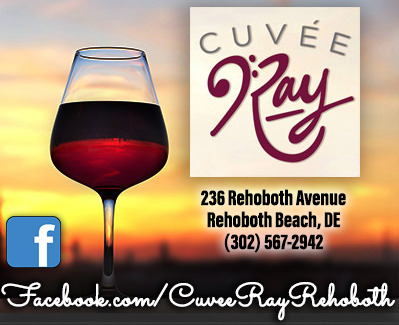 Located at 236 Rehoboth Avenue in Rehoboth Beach, DE., Cuvée Ray is the relaxed upscale wine bar and restaurant in downtown Rehoboth that celebrates wines from around the world, great music, and inspired food. Offering over 170 wines by the glass, Cuvée Ray is a place for the casual wine lover and the experienced aficionado serving wines that are both exceptional and accessible. FOR MORE INFORMATION, VISIT Cuvée Ray ONLINE AT WWW.CUVEERAY.COM! Listen to Ray Kurz’s ( AKA Cuvée Ray) weekly update every Saturday morning at 11:15 on Coastal A&E With Host Michael Sprouse! Cuvée Ray is a proud sponsor of Coastal A&E On Delaware 105.9 FM! Since 2014, television and radio personality Michael Sprouse has served as the On-Air Host and Executive Producer of both Coastal Cuisine and The Arts & Entertainment Report over a wide range of multi-media outlets. His always entertaining and informative episodes focus on all aspects of the arts, cuisine, and leisure from across DelMarVa and beyond! Coastal A&E, The A&E Report, Coastal Cuisine and Creative Coast are produced exclusively by TwinFin Media, LLC. Listen to Michael Sprouse LIVE every Saturday morning between 11 AM and 12 when he hosts Coastal A&E on Delaware 105.9 FM and every Monday at 5 PM on Creative Coast on 99.1 FM Radio Rehoboth!